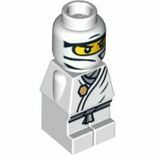 Zane, also later known as The Titanium Ninja and Zane 2.0, is the white ninja of ice minifigure from the Ninjago theme. He is a robot, or a "Nindroid" as Jay dubbed him, built by Dr. Julien to protect those who cannot protect themselves. 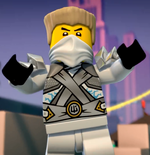 Zane is a main character in Ninjago: Masters of Spinjitzu and has appeared as a playable character in LEGO Battles: Ninjago and LEGO Ninjago: Nindroids. This 2015 variations is incomplete. 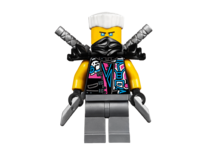 Zane appears in 8 physical variations; as a trainee ninja, a DX (Dragon eXtreme) Ninja, a Microfigure, a ZX (Zen Xtreme) ninja, a Kendo ninja, a NRG (Full potenial) ninja, a kimono Ninja, a techno robe ninja, battle damaged techno robes, a second techno robe variation seen in the set 70728 Battle for Ninjago City, and the Titanium Ninja variation. As a normal ninja, Zane had a torso part similar to the classic ninja torso first used in the Ninja theme in 1998, in white aswell as the classic wrap. Zane's face print (which would normally be covered by the ninja wrap with the exception of his eyes,) is made up of two black eyes with white pupils, a straight line for a mouth, a line below showing a chin, and two eyebrows pointing downwards. His torso is a white ninja robe with black hands and no back-printing. The printing that is on the front reveals light grey clothing under his robes. Also on the torso, is a little golden emblem, which is most likely a symbol of Ice in Ninjago, that also appears on Zane's spinner. Zane's legs in this variation are white with light grey knot pattern printed on the hips and legs. As a DX ninja, Zane uses the same face and headgear as his first variation, but utilizes a special torso and legs combination. Zane's DX torso features printing on both the front and back; on the front, a golden depiction of the Ice Dragon. On the back, the name Zane and the ice symbol are printed on in gold. On the legs, a different knot tied to his left is printed. Also on the legs, is a continuation of the Ice Dragon design, here the tail is printed. 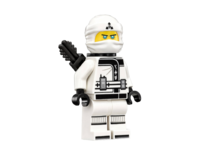 Zane as a microfigure is similar to Zane as a normal ninja but in a smaller scale, which can be found in the Ninjago board game. As a ZX ninja, his cowl has a golden visor which resembles the top of the ice dragon design. He still wears mostly white, but in ZX form he also wears golden shoulder armour which can hold two katanas in the back. Zane's face is the same as always, but his torso has been updated with the under-robes being white, instead of grey, and having tan embroidering, as well as a printed design of some lightweight armour. On the back is the golden ice dragon symbol, which is absent from the front. Zane's torso pattern continues onto his legs. As a Kendo Ninja he has a new mask with a grill slightly showing his face. He also has the Samurai Warrior's armour on top of his original white ninja outfit- His torso is a white ninja robe with black hands and no back-printing. The printing that is on the front reveals light grey clothing under his robes. Also on the torso, is a little golden emblem, which is most likely a symbol of Ice in Ninjago, that also appears on Zane's spinner. Zane's legs in this variation are white with light grey knot pattern printed on the hips and legs. NRG Ninja is when Zane unlocks his full potential. This variant looks similar to his ZX variant, but without golden shoulder armour. The variant is mainly light blue and silver, except for the white hands, with blue silver streaks which are a symbol of his ice power. These streaks are on his back, front, legs, and visor. The Ninjago ice symbol appears on the upper left of his torso. Kimono Zane is white, black, and gold and has a new design. His hood is white with a gold visor, he has a new torso printing all in white, black, and gold. 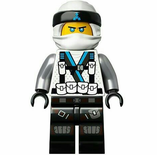 He has a white belt on, his arms are white, he has black hands, the same face as Zane ZX and has gold markings on his torso. In Ninjago: Masters of Spinjitzu, Zane appeared in all of his physical variations, as well as in various causal clothing. In his first Techno Robe variant, Zane has a yellow face, with a thin mouth, and white pupils. He also has big eyebrows printed above his eyes. He has a tan hairpiece and a white ninja bandana. His torso is mainly white, with icy light blue accents. He has a silver cloth belt, which extends over his shoulder. A grey medallion with Zane's Ice symbol is printed on the left side of his torso. His back has a blue ice symbol surrounded by a black cloth and a white circle. He has white arms and he is wearing black gloves. His legs are unprinted and white. His battle damaged Techno Robe variant is similar to his standard techno robe, but with grey robot printing. Zane's 'Titanium Robes feature a brand new reversible face with a blue visor. His hood is chrome, with his elemental symbol on the crown in white. 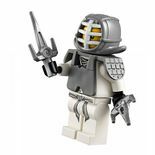 Zane's outfit is chrome as well, with a white medallion held on his robes by white cords. His legs are printed with white knee pads. Zane was created by Dr. Julien in a small workshop, located deep in the depths of Birchwood Forest. He spent many happy years with Dr. Julien, who taught him skills such as cooking. During this time, Dr. Julien also built the Falcon to act as a companion for his artificial son, and the mechanical bird would continue to aid Zane throughout his life. He then gave the ninjas their new suits and told them about their elemental powers. Zane became the ninja of Ice. Then the ninjas were sent on a mission to find and collect the four Golden Weapons of Spinjitzu before Lord Garmadon could. At the Caves of Despair, the location of the Scythe of Quakes, soon after the scythe was recovered by the ninjas, they were attacked by an army of Skulkins led by Samukai, the King of The Underworld. Jay noticed while battling that the fighting patterns were similar to the patterns in the training course at the monastery and started going through the motions he had learned from Sensei Wu, and he summoned a tornado of energy corresponding with his element. In other words: he performed Spinjitzu. Zane and the others followed and were also able to perform Spinjitzu. Samukai and his legion retreated, as the Earth Dragon protecting the Scythe appeared behind the ninja. In desperation, Kai used the scythe, despite Wu's instruction not to use the weapons power, as no mortal could handle it. A rift appeared in the cave ceiling, and the ninja manage to escape. As the ninja headed to the Shurikens of Ice, Wu taught them the most powerful move in Spinjitzu: the Tornado of Creation. The boat arrived, at their destination, and crashed into the island of ice, where the ninjas entered the frozen plains. The three escaped another dragon, the 2260 Ice Dragon Attack, as Zane was frozen upon contact with the weapons, and the others used him as a snowboard, with the Shurikens of Ice now being in their possession. Next, At the Floating Ruins, they climbed a giant chain to the Nunchucks of Lightning. Once they retrieved the Nunchucks, they jumped down from the Floating Ruins to escape the Lightning Dragon, using inventions that Jay had constructed (jet packs with spawn wings) to lower themselves safely to the ground. The ninjas were at such a high altitude that they were able to fly to all the way to the Forest of Tranquility, the location of the Sword of Fire. The group went to sleep in the forest. Kai left while the others were asleep because he had been tricked by Garmadon that his kidnapped sister, Nya, is in the forest. Sensei Wu later left to follow Kai, while Zane, Jay, and Cole were still asleep at their camp. Samukai and the army of Skulkins then arrived, stole three of the golden weapons, and tied the remaining members of the group to a tree. Jay grabbed General Nuckal's sword and cut the rope while the Skulkins were not looking. The three ninjas tried to chase the Skulkins as they escaped with the golden weapons in their vehicles, but the Skulkins escaped to the Underworld. After the Skulkins got away, the ninjas went to the Fire Temple seeking help from Kai, but Zane sensed that the Sword of Fire wasn't there any more. Then the Fire Temple opened to reveal Kai and his sister, Nya, on the Fire Dragon. Zane then learned of the sacrifice that Sensei Wu had made to protect the Sword of Fire. The ninjas quickly retrieved their elemental dragons and traveled to the Underworld. While in the Underworld, Zane battled the Skulkins and giant spiders. He witnessed Samukai defeat Sensei Wu in battle and take the Sword of Fire from him. Samukai was then seemingly destroyed by the power of the Four Weapons of Spinjitzu all at once, but the combined power of the weapons opened a vortex through space and time which allowed Lord Garmadon, Wu's evil brother, to escape from the underworld. Zane then traveled to Kai and Nya's village where he and the other ninjas were welcomed as heroes, allowed to rest until Lord Garmadon returns. In Flight of the Dragon Ninja, Jay is trying to convince the Ninja that he was the best out of them all after having won in a race with their Dragons beforehand. They decide to hold another race, although Zane objects, claiming they should be training instead, to which Kai assures him that riding their Dragons is a form of training. After Cole wins, Zane says he didn't remember agreeing to the terms before hand. In Battle Between Brothers Zane notices Sensei Wu wearing a new black kimono and tells him it is "most extraordinary." Wu thanks Zane and tells him it has powers against evil and reminds him of the day Garmadon was banished to the Underworld. In LEGO Ninjago: Rise of the Snakes, the four ninjas rush to Jamonakai Village to investigate the reports of Lord Garmadon's return. Instead they find Lord Garmadon's son, Lloyd Garmadon, threatening to unleash the mystical Serpentine if he doesn't get all of the candy in town. As the ninjas were leaving they found a scroll in one of the bags on the Fire Dragon, telling that one ninja would rise above the others and become the Green Ninja. The ninjas decided when they got back to the monastery to hold a competition to determine who would become the Green Ninja. Jay was eliminated first, then Zane, and as Kai and Cole were competing the Sword of Fire started a fire in the monastery. Sensei Wu told the ninjas that they were nowhere near the level it took to become the Green Ninja, and that they needed to unlock their golden weapons and find their true potential. In the second episode of Rise of the Snakes (Home), Zane is found by the other ninjas to be weird, and is the odd one out. For example, when Zane cooked food and came out wearing a pink apron, the other ninjas started a food fight and embarrassed Zane. Then he went outside and found a falcon trying to communicate with him. Zane followed the falcon and it showed him where Lloyd Garmadon had begun to build his tree-house fortress, commanding the Hypnobrai tribe of Snakes in order to get a foothold in Ninjago. The next day Zane took the other three ninja to the tree house fortress to stop Lloyd. During the battle, Cole, who had been previously hypnotized Skales, was pitched against the ninjas as a distraction while the snakes went to go retrieve their Snake Staff from the monastery. Zane was the one who suggested Jay try to shock Cole out of his trance with lightning. Sensei Wu came and cancelled out the Hypnobrai's powers on Cole using a magic flute, then the ninjas returned to see their monastery only to find it up in flames. When Zane suggested this was a teaching moment, the other ninjas turned on him. Sensei Wu told them to apologize, but just when they were about to, Zane had already flown off on his dragon. Sensei Wu took the ninjas into the desert, where they were stranded without a home. Suddenly Zane returned and said that he hadn't left because of them being upset with him, he had simply seen the falcon again and had followed it. Zane said he had found a new place to live and showed them the ship Destiny's Bounty, which became the ninjas new home. Kai, Cole, Jay and Nya raced into the ship because Zane had made dinner for them. Sensei Wu stayed behind with Zane to speak with him a moment, and told Zane that there was more to him than met the eye. Zane asked if he was destined to become the green ninja but Sensei Wu told him it was too early to tell. In the episode Can of Worms, Lloyd tricked Jay's Training Robot malfunctioned and Jay blamed Zane. Zane and Kai's suits get mixed in the wash, resulting in a pink ninja suit. They figure out that it was Lloyd. Nya discovers the location of the Constrictai and Venomari tombs, so Jay and Kai take on the Venomari while Cole and Zane take on the Constrictai in an attempt to stop Pythor from uniting the Serpentine. Cole and Zane are apprehended by Skalidor, but use the Sacred Flute to defeat him and escape. Kai becomes intoxicated by Venomari venom as the Serpentine ambush them. Cole and Zane arrive on their vehicles to help, but the ninja become cornered. Before facing their demise, they were rescued by a mysterious figure known as Samurai X.The ninja later share this story with Sensei Wu aboard Destiny's Bounty, so Wu tells them to travel to Ninjago City to stop the Serpentine from uniting. The ninja use the power of rumors to their advantage there, but are spotted by Skales. They escape on Zane's Snow Mobile while being pursued by Pythor and Skales. In the episode Tick Tock, he once again saw the Falcon, and he took the ninja through all of Ninjago with him to follow the falcon. The other ninjas got tired and stayed behind to rest, but Zane continued to follow the falcon. After he reached a snowy wood, the falcon sparked, and he discovered it was a robot. Soon after, he defeated a robot that was supposed to protect the wood from "Treehorns," and found an old house. In the house, he found that it was the house he had lived in before, and found the blueprints that his father had made to build Zane. That was when he discovered that he was a robot, or Nindroid, as Jay dubbed him. When the ninjas found him, he opened up his chest, revealing the switches and cords inside himself. The other ninjas were shocked. He wanted to stay in the house for a moment and had the other ninjas wait outside for a moment, then he flipped the memory switch on after the others left. He then remembered everything about his past, and rushed outside to tell his friends. Instead he found the other ninjas being defeated by the Treehorns, and helped them. After recovering his memories, he felt stronger, and was able to unlock his full potential, defeating the Treehorns in his NRG form. In Once Bitten Twice Shy, he, Kai and Cole go to the Mega Monster Amusement Park to stop the Serpentine from having the first fang-blade (maybe the Constrictai fang-blade because the Serpentine had to dig it up)but he accidentally froze himself, Kai, and Cole. At the end he says Nya fooled him. He never guessed that Nya was the samurai. Kai then talked about a conversation about that who they thought was the best would be the green ninja. Cole said draw on a blank, Jay said that why would they say that, and Zane said that that the conversation was not in his data base. In the episode, The Snake King, the Ninja are led to the center of the colosseum, and Pythor announces another Slither Pit. Just then, Samurai X is also led out. The duel begins and the Samurai throws projectile weapons at them, but they dodge most of them. Pythor makes the game more interesting by tilting the stage and revealing spikes. As the Ninja hang onto Samurai X's exo-suit, he tells them to keep the charade up, and begins flying. However, the suit is too heavy and he ejects himself from the mech, allowing the Ninja to escape safely, much to their anger. As the exo-suit falls to the desert ground, Zane, Jay, and Cole fall and land near each other. In the episode Day of the Great Devourer (Episode 13), Zane gets half of his face torn off by the Great Devourer, partially revealing his robotic face. In Darkness Shall Rise, the Ninja are house hunting. The only house they can afford turns out to be a one bedroom, one half bath apartment without lighting. Jay and Kai argue they need a better place to train Lloyd, and agree to buy an expensive hero suite that's out of their price range. To help pay for this, Zane takes on a job as a professional chef. While fighting snakes, Zane shows the ninja that they can use makeshift weapons. In Double Trouble, Zane realizes that the school was originally made for evil, there must be hidden passages. In Ninjaball Run, Zane realizes that "Darnagom" is just an anagram of "Garmadon" and that Lord Garmadon is trying to destroy the dojo so Lloyd will have no where to train. In the episode,Child's Play, Zane, along with the other Ninja are turned into kids by Lord Garmadon and are chased by the Grundle, and at the end of the episode he and the other Ninja returned to normal. In the episode The Last Voyage, Zane and the rest of the ninja sail to an island with a prison tower. When the ninja get to the top, Dr. Julien greets them and takes them in. Inside he seats them and haves a robot serve them tea. There, Dr. Julien tells Zane what happened after his apparent death. After Dr. Julien turned off Zane's memory switch, he really did pass away, but Samukai revived with a special elixir in return that he create the Skeleton Army's vehicles. When Dr. Julien refused, Samukai locked him in the prison tower with a Leviathan to keep guard, promising the doctor if he did what he said, he would see Zane again. However, time elapsed. After he finished telling his story, the Leviathan comes and sends out a tentacle with eyes to check on Dr. Julien, while the others hide. After it goes away, Dr Julien and the ninja work together to fix the Bounty's rocket boosters. As the Bounty takes off, the Leviathan grabbed the ship. Zane jumped into the water and freed the creature from its chains using star teeth. Freed, the Leviathan lets the Bounty go, they fly off to the Island of Darkness. When they get to the Island of Darkness, they soon find Garmadon's camp on it. Zane spots his crashed Falcon inside and rushes down. He retrieves it, but Stone Warriors spot him and ninja's plan gets ruined. When they find the Temple of Light, just like other ninjas, Zane gets his new outfit and ice elemental blade, as well as new powers which he uses in a fight with Stone warriors in the temple. 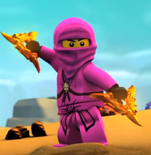 In Return of the Overlord, he and other ninjas try to stop Nya who has turned evil by Garmadon, without hurting her. Zane does that perfectly when he freezes her with his ice elemental blade in a ball and leaves her. In Rise of the Spinjitzu Master, Zane sees his falcon who leads ninjas to the Temple of Light again, where Lloyd finds Golden Mech that leads him to the city, where the final battle with Overlord begins. When Jay and Cole get infected by dark energy, Zane stands back to fight them, but soon he gets corrupted in darkness too. After Lloyd defeats the Overlord and light gets back to the land, Zane and all other people get back to normal. In REBOOTED series, Zane begins working at Sensei Wu's academy along with other ninja. There he often gets electrified by students who enjoy playing with him. When he goes on a trip to Borg Industries with students, he meets P.I.X.A.L., a female android and they start having feelings for each other. As P.I.X.A.L. 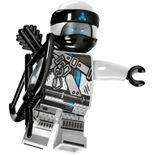 leads the children for their field trip, Zane and the Ninja go to see Cyrus Borg, the inventor of New Ninjago City and famous Borg Industries. Later, Cyrus Borg reveals that Zane's father Dr. Julien had died. He gave them a golden statue and warned Kai, telling him that they need to protect"them" with their lives. As the ninja get into an elevator the statue is dropped and it smashs open,revealing the Techno-blades. Soon after the whole system of Borg tower gets hacked. Zane finds out how to use Techno-blades, hacking one of HoverCopters and turning it into his elemental vehicle. P.I.X.A.L gets hacked too, and uses Zane's blueprints only to create new type of Nindroid Warriors and General Cryptor. When ninja get to their hideout at Sensei Garmadon's monastery, Zane stays out at the night, guarding the place and keeping the Techno-blades away from Garmadon who swore to never use weapons again. He gets attacked by corrupted P.I.X.A.L. but defeats her and re-programms her turning her back to the normal state. Nindroids attack them, and they go to the Ninjago Power Station to shut off the power and temporarily eliminate Overlord's virus. There, a battle occurs and ninja destroy the power generator, shutting off the power in the land and killing P.I.X.A.L. Zane revives her by giving her half of his unique power source, but can't do spinjitzu without her anymore. Cyrus Borg sends ninja to a mission to enter the digiverse and use their Techno-blade powers to destroy Overlord's virus, and Zane finds out that he only needs to imagine something and it comes true, as anything is possible in the Digiverse. That's how he turns himself into the golden ninja and along with others, uses his glowing suit to reflect the light and destroy the Overlord. The Overlord is still alive, in his spirit form outside of the Digiverse. Zane gets his ice powers back and finds out about the "project Arcturus" which might be a clue of Pythor's next plan. Kai gets kidnapped while Zane remembers that Pythor probably keeps him in the Lost City of Ouroboros. He leads his teammates there where they save Kai and find out that Arcturus is a huge spaceship that Pythor is planning to get to space and retrieve the Golden Weapons to make Overlord The Golden Master. Ninja get into the ship and blast off to the space. When they reach the outer space, Zane exits the ship as he doesn't need oxygen to breath. He finds space suits for ninja so they all get out where an epic battle against Nindroids happens. Cryptor enters into a comet that has the Golden Weapons in it and Arcturus crashes into it. Ninja survive the crash but can't find Nindroids. When they find out that they are hiding in a cave with the Golden Weapons, they get attacked by alien bugs. Bugs almost eat Zane's skin so ninjas get away, being defeated after metal-eating bugs destroy their vehicles. Cryptor gets back to the Earth with Golden Weapons. However, ninja used their elemental powers to rebuild the spaceship and Zane uses his power source to power it. There he finds out that his energy is almost infinite. Ninjas get back to Ninjago City, which got turned into a giant fortress with Overlord destroying it. Zane along with other ninja puts on Stone Army Armor and gets into the final battle against the Golden Master, who creates a huge web over the city and captures ninja in it. Zane avoids it and frees himself, jumping in front of the Overlord. He glows, and starts using his power to freeze him. He tells the Overlord that "It's not about numbers, it's about family" and weakens his power to free ninja. Ninja and their senseis hide underground while Zane makes an ice storm to destroy the Overlord. Zane can't stop using his power and he starts being aware that he will die soon. He remembers all of happy moments from his life, and his father. In the end, he only smiles and his power source explodes, causing the ice explosion that covers New Ninjago City in the snow. When it gets over, ninja get out of the underground shelter, finding out that Zane sacrificed his life to kill Overlord and save them. Later on Zane's funeral, everybody cries and Kai shares a tribute to Zane. Cyrus Borg reveals a statue for Zane, calling it "The Titanium Ninja". Back at Borg Tower, all of computers show every moment that Zane had with P.I.X.A.L. P.I.X.A.L. sees that and starts hearing voices inside her head. Suddenly, a picture of the factory line shows up and ray of ice hits it. P.I.X.A.L. runs down to the factory, and when she opens the door, she looks up seeing something bright and big, while a digitalized voice asks one thing - "Are we compatible now?" Zane managed to create himself a new body, but he was captured with P.I.X.A.L by Master Chen and stripped of his elemental powers. Zane was imprisoned on Chen's secluded island and used as bait to lure the remaining ninja to the Tournament of Elements. Just before the elemental masters arrived, Chen visited the dungeon briefly to check up on the imprisoned Master of Ice ("The Invitation"). Zane eventually attempts to breakout. Zane succeeds, coming to get P.I.X.A.L and escape together. To Zane's surprise, P.I.X.A.L was scrapped. Zane sees P.I.X.A.L's memory drive and inserts it into his processor, loading her personality into his. Clouse and some cultists discovered Zane and shut him down, locking him back into the room ("Versus"). Cole, after loosing his fight with Jay, was captured by the cultists and taken into the catacombs where Zane was being held. Cole discovered Zane and together they attempted to break out and escape from Chen's island. During this attempt they were almost stopped by Clouse's pet "serpent," but they eventually did escape. Feeling sorry for the other prisoners who they left behind, the two ninja returned to free them all ("Spy for a Spy"). When the ninjas turn into kids in "Child's Play", the other ninja suggest that they were in a dream, but Zane said that Nindroids don't dream. However, he did have one in "Never Trust a Snake". Zane's preferred weapons are the Shurikens of Ice and a golden flail. He is the only ninja to change his primary color twice (light blue in NRG, silver as The Titanium Ninja). His shield is the same one used on the Gungan Warrior. He and Skylor are the only ninja with only one variation in the first half of 2015. The inside of his torso has changed from the past seasons to season 3. Originally, his inside had switches that allowed certain functions while those have been replaced by his mysterious heart. Zane was cool, but now he's even cooler. He tamed the chilling Ice Dragon, unlocked the power of Spinjitzu, and even found a slick, Spinjitzu Dragon Suit. Now Zane and his dragon are ready and will crush the Skullkins like an avalanche. He knows the Skullkins will fall to his ice attack, because he's seen the future…and he know he's already won. Zane [Frosty] is quiet, very smart, and often sees the future or knows what to do without knowing exactly why. He is very loyal to his friends, even though they like to tease him when he doesn't get their jokes, or laugh at him when he doesn't know he's said something funny. Despite Zane's odd ways, the ninja see Zane as one of their brothers. As Sensei Wu says, brothers can be very different. Still, he wishes more than anything that he could be normal, and he is determined to discover more about his past. He is convinced that will help him feels like he is the odd one out. Zane is the ninja of Ice. He was known in his village for being able to sit at the bottom of a freezing lake for an incredibly long time (something it turns out he was able to do because he is a robot). Although being a machine has not changed his friendships with his teammates, it does sometimes make him feel different and a little lonely. Zane’s blueprints end up being used to create the Nindroid army, which inspires him to fight this new foe even harder. While still very logical and practical, meeting P.I.X.A.L. causes him to feel all new emotions. "The Oni and the Dragon"
LEGO Club Magazine Issue 1 2011 - Lessons of the Dojo! Zane in a pink suit. Zane revealed as a Nindroid. Zane with half of his face peeled off. Zane representing the continuation of Ninjago in 2014. While still very logical and practical, meeting P.I.X.A.L. causes him to feel all new emotions.